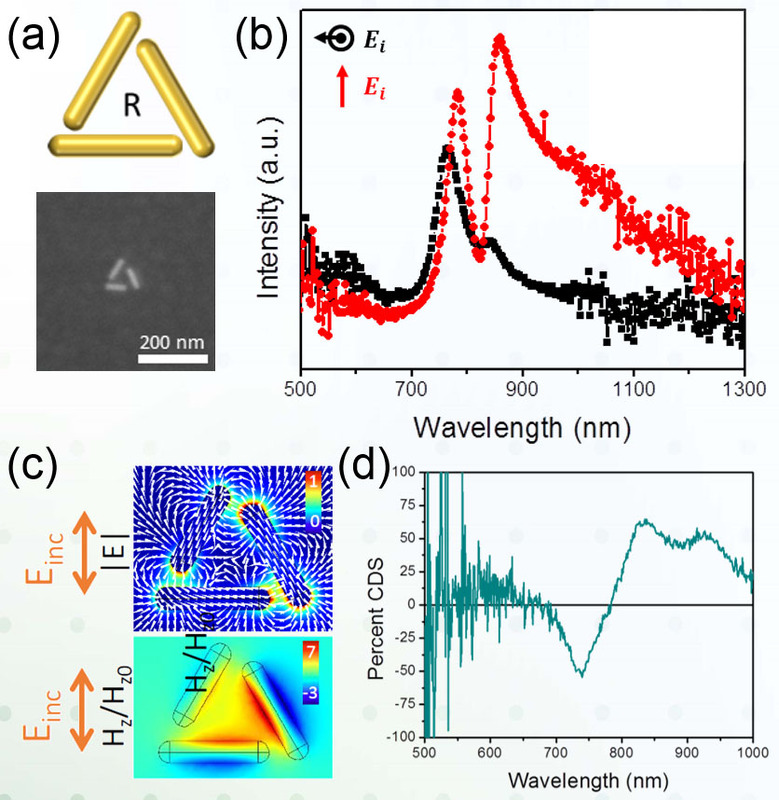 The groups of Kagan, Murray, and Engheta in IRG3 teamed up to (a) synthesize gold (Au) nanorods (length of ~110 nm, diameter of ~22 nm) and direct their assembly in lithographically-defined templates to form nanorod equilateral trimers. Axial displacement of the nanorods created “right-handed” (R) and left-handed (not shown) two-dimensional chiral enantiomers. Spatially-resolved, darkfield scattering spectroscopy (b), in concert with numerical simulations (c), revealed underlying rotation- and polarization-dependent, hybridized plasmon modes of the structures. The trimers exhibit electric- and significant magnetic-dipole plasmon resonances that contribute to the overall scattering response. Measurements of circular differential scattering suggest that the structural chirality is accompanied by substantial chiral optical response, as the substrate and direction of illumination breaks symmetry in three dimensions. The research gives rise to a new class of functional pluperfect nanoparticle structure. (a) Schematic and SEM image of a colloidal Au nanorod (NR) trimer and (b) its s- (red) and p- (black) polarization dependent darkfield scattering spectra. The intensity is normalized by the peak intensity of the s-polarization spectrum. (c) Electromagnetic simulations show a circulating pattern of electric dipoles in the electric field map (top) indicative of the enhanced magnetic field within the center of the NR trimer (bottom). (d) Axial displacement of assembled Au NRs creates “left-handed” (not shown) and “right-handed” 2D enantiomers. The substrate and direction of illumination breaks symmetry in three dimensions, known as extrinsic chirality, creating a chiroptical response. Read the article in ACS NANO.